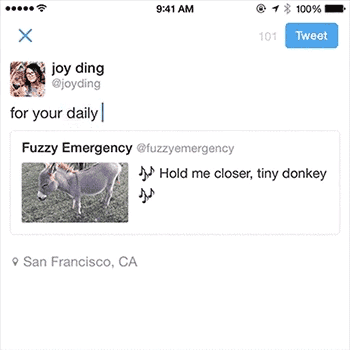 Video showing how tweet quoting works. See original tweet from which I swiped the video. Twitter has officially released its new-ish tweet quoting feature. Since at least last June, if a user included the URL of a tweet within a new tweet, it would present viewers with the full body (albeit smaller) of the referenced tweet within the new tweet. Now that feature has been formalized. Users should see it when retweeting a tweet as the option to quote a tweet (which previously would just wrap the original tweet in quotes). Twitter’s (current*) prohibition on retweeting oneself means that users cannot easily quote their own tweets to add alternative text — at least not in the Android app nor on the web. TweetDeck allows it, so perhaps we’ll see it in the app or web site. Because a quoted tweet is not a reply, it doesn’t show up in the list of replies when viewing the original image tweet. This means a missed opportunity to be associated with the alternative text when viewed on its own. When viewing the tweet providing the alternative text (as a standalone tweet, not in the timeline) in the Android app, the image within the quoted tweet is not displayed. Embedding a tweet that acts as alternative text doesn’t show the original quoted tweet (nor its image). There isn’t an option to embed media, so web page authors will likely embed the original image tweet instead of the alternative text tweet. You can see this example below. Twitter is missing an opportunity to provide an interface that prompts users to provide alternative text. This might help stem the inconsistent efforts from those who want to provide accessibility (such as 18F’s noble but under-informed efforts). The first image shows a tweet quoting an image tweet when viewed in the timeline (the quoted tweet’s content is visible). The second image shows a tweet quoting another when viewed on its own, demonstrating that the quoted tweet’s content isn’t displayed at all. Note in both views that I cannot retweet my own tweet (the option is disabled). Sample tweet that quotes an image tweet, but does not show the quoted tweet. * From the Twitter page explaining the feature, Note: You cannot Retweet your own quote Tweet.